Just in time for your spring and summer outing, RuMe has the Kennedy Tote for you! 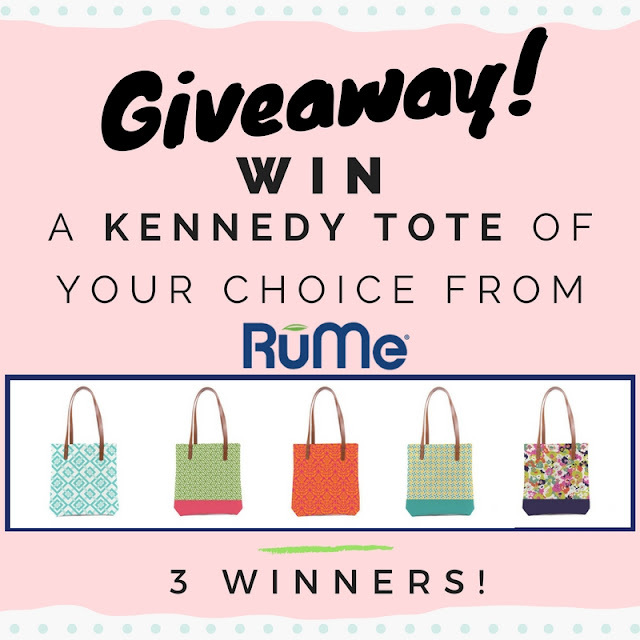 You can win your own Kennedy Tote! These totes come in many amazing designs to please any taste! The Kids Did It and The Mommy Island are hosting this giveaway hop! Make sure to enter all the giveaways below! I liked the Charlotte and Vera totes. I like the Willow and the Emma! I like the Logan and the bifold styles. I like the Camilla the most and the Penelope the second. I really like the Vera and Abby. I like the Bailey and Maisie totes. I also like the around town Crossbody handbag. My two favorites are Ophelia and Camilla!! These are all really nice!!! I like Abby and Camilla. I like The Logan Tote and The Daisey Tote. I like the Opehlia and Logan ones the best. I like the Logan and the Charlotte. I like the Logan and the Camilla totes. They are so pretty! I like the Fiona and Ophelia. I think my mom would like Logan, and I like Baily. I like the Bailey and Logan totes. They are all so cute. Ophelia and Bailey are my favorites! Thank you for the chance to win! The Logan and Elsie are my favorites! My absolute favorite is the Logan Tote. My 2nd favorite is their Winny. My favorites is the Willow and the Bailey. They have alot of super cute bags! I like both the Camilla and the Winny. I like Meow Tote and Ophelia Tote. I really like the Phoebe & Camilla they seem pretty. I would love to have the Abbey and the Calista designs. I like C-fold and Vera. I like the Felicity and the Camilla. I like the Logan and Phoebe styles. Thanks. I love the Camilla and the maisie! I like Charlotte and Vera! I like the Fiona and the Trista! I like the Winny and the Scarlett. I love the Vera and Elsie patterns! I love the Shadow Cat Tote!!!! I love the Shadow Cat Tote and the Meow tote! I love the Logan style and also the Vera style! I like Elsie and Logan the best. I really like the Emma and Scarlett bags. My two favorite styles are Penelope & Vera. I like the Felicity and Fiona. I like the Abby and Vera totes a lot. Cute patterns! I like the Trista and Daisey. I like the Emma and the Vera. Very nice totes. I like the Felicity and the Camilla the best. 2 of my favorites are the Camilla & the Penelope! The Beach Builder Create-A-Sand Castle Building Kit looks like fun! What great totes! I love the Camilla and Bailey! I like the Charlotte and the Penelope. I like the Maisie and the Vera styles the best. Lots of cute bags. I love the Maisie and Logan totes! Logan. Bailey and Ophelia..really nice and fantastic price! My favorite styles are the Elsa, Emma and Abbie. These are such cute bags. My favorite styles are the Mazie and Willow! I like the Camilla the most and the Logan second. I like the Maisie and the Phoebe. My favorite styles are the Fiona and the Penelope Kennedy Totes. I love the Logan style. The color is great! I love the Mandala Beach Throw - so pretty! I really love the Vera the most. My second choice would be the Maisie. I like Calista and Logan. I love the Logan and the Abbey! My two favorite styles are the Felicity and the Ophelia. I like the Winny and Emma totes. I like the Logan and Elsie. I like the Felicity and the Penelope. The Bailey and Camilla are my two favorite styles. I like the willow and the logan. I like the Camilla and Maisie ones! they are all great but camilla is my fav, followed by vera!!! My two favorites are the first two, logan and ophelia. I love the Logan and the Willow! I like both the Vera as my favorite, and the Penelope as my runner up favorite.